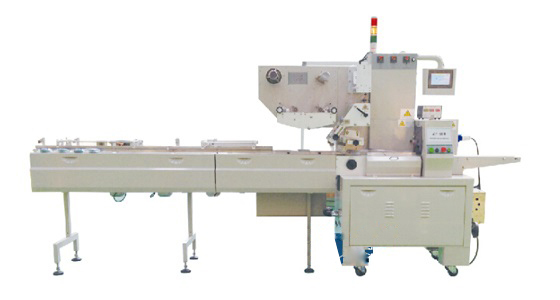 It’s a fully automatic flow wrapping machine for food, cosmetic, soap, medicines, etc. 6. Independent temperature control for each sealing device (mid sealing and end sealing), which is suitable for a wide variety of packing materials. 7.Device for intermission air charging and alcohol spray can be mounted (only for food industry). Remark: This machine can be facilitated with 3-section smart infeed group, so that this machine can work with upstream machine synchronously. 7. Device for intermission air charging and alcohol spray can be mounted (only for food industry)..
8. There are two rolls for mounting the films, which is convenient for film shifting .